After days of driving, driving, driving, we decided to take a day of rest in Nouadhibou. The camping site was nice and clean, always one of the employees raking the sand in the yard (competing with the cats, who think, it´s their toilet), hot shower, and a nice cafe with wifi, perfect coffee and cakes around the corner. Around noon each of us took their own tour trough the city. Igor found the waste site and the harbour, but it was striktly prohibited to enter. I walked around town, looking for dividends, people shaking heads and laughing at me when I took pieces of the profuse waste from the street and put pieces into my plastic bag after taking a photo. Somebody tried to explain, that it is not healthy to collect the trash and talked me out of taking a dividende after having 5 great pix. Around 4 p.m. we decided to drive to the cape, where the travelling guide promised flamingos, pods and jackals. 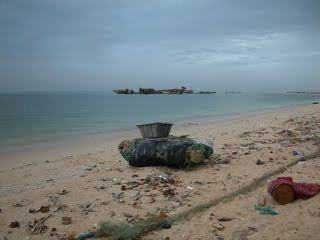 We did not find any of this, but spotted some rusted ship wrecks in the sea, near the harbour. 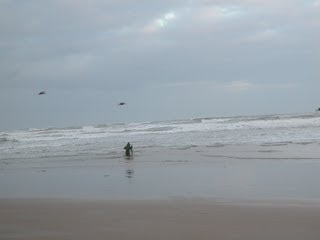 Manuel was happy to go offroad again, and through the sand we approached the beach: smelling disaster of dead fish, thousands of them; bulks of trash, from torn fishernets to rusty cans and clothes. I walked with Igor along the endless rows of dead fish, when suddenly 2 human figures appeared in a shack: an old men and a young one. They wanted us to take photos of them and pay. We prefered to talk, but it did not really work out. 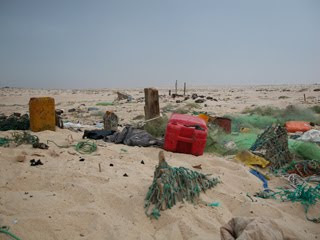 A few meters further, another man appeared, and he told us, they all were refugees from Westsahara, living here in shacks and eat the fish they caught from the sea. Asking about the many dead fish on the beach, they could not tell. He told, that this was the place where ship wrecks were brought to be dismantled, the useful parts were sold - some of them to China. Ships from here go to China for trade, but since the economic crisis it did not work well anymore. He invited us for tea in his shack, but it started to rain and we had to rush – otherwise our Steyr would get stuck in the sand. Back to our camping site, we told the patron about our findings and our project. 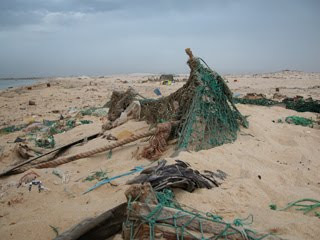 It turned out, that he had started an NGO last year to clean up the beach. It was a private initiative. 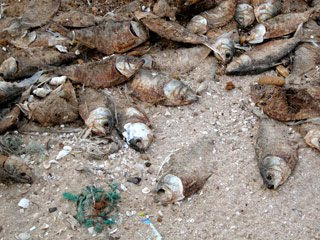 As a child, they were swimming in the sea, but now everything is polluted. According to Koran, you should keep your environment clean, and that was what he wanted to do. He seeks help from international partners, because the Mauretanian government is not interested in his project. At the moment he is talking to everybody to arise awareness – he believes, that direct contact is the most efficient. 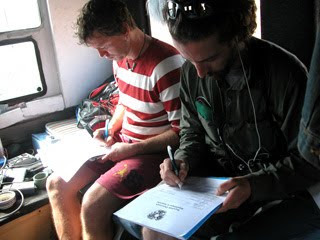 We made an appointment for an interview for next morning 9 a.m. – on the camping site and on the beach. 7. 12. starting early in the morning after a sip of coffee, second portion prepared for beeing cooked while driving. The water we had bought in the last village had disappeared mysteriously (probably we drunk it), so no dishwash. After a few meters our Steyr got stuck in the soft Sahara sand. Out of the car, collecting stones (and photos), shoveling sand. On the second try Manuel made it - back to the road and go. Sandy endlessness on the left, the sea on the right sight, hours and hours. 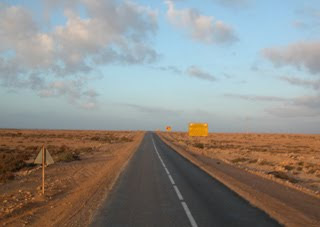 At about 5 p.m. finally arriving the border to Mauretania. Our Steyr was scanned before leaving Morocco, we asked for a photo of the scan. They showed us, but could not give it away: top secret. Leaving Morocco the street ended. No more pavement, rusting car-wrecks in the sand. End of civilisation? Igor found a nice dividende for one of our lucky shareholders. We were the last ones this day crossing the border. 6. 12. Starting early morning with coffee still cooking on the gas cooker. We have only 3 cups for 4 people, 2 teaspoons, 1 knife, no pot, only paper plates. There is 1 stool which usually serves as ladies´ pedestal for entering the truck, or as table for our home-cooked meals. Maximum speed of the truck is 80 km/h, but sometimes road condition allows not more than 20 km/h. The back of the truck was converted into a living space, mostly by our Schaumbad-collegues Max and Martin Gansberger, and they did a real good job. It works very well for living in sleeping, although work is not real possible - our Steyr is shaking real hard on the harsh roads. 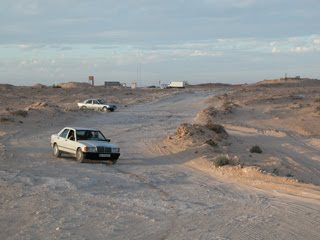 Offroad-excursions are fun on the front part of the car, driving through the deserts. This is Manuel´s ambition in between the long periods of monotony. 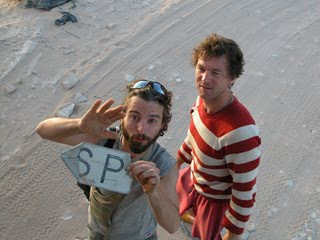 At noon we had a short ride through the pathless West Sahara table mountains, we out in the mountains filming and taking photos, or shooting out of the combat hatch on the roof. Then back to hours of monotony. Around 6 p.m. arriving in a small military town and wanted to buy vegetables and fruit for dinner and breakfast. It will come soon, said the shopkeeper. Waiting, we found a billiard table, Manuel and Stefan played a match. Local men stood on the street, watching them trough the window. The room was too small for a proper billiard cue, there was a shorter one for the narrow parts. My camera batteries were empty as usual, because the charging system in the car regularly breaks down when we all charge our devices. Igor was running around taking photos, a man followed him to tell, that this is prohibited. Igor disappeared somewhere. Looking for him, I found a nice dividende for our lucky shareholders: some Hilfiger/Fishbone cloth, none of us can identify the use of it. I took it, even though unable to take a photo, when Igor approached me, telling that he just came back to collect this cloth. The photo was taken already. 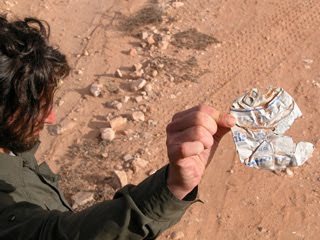 The perfect Morrocan garbage system breaks down at West Sahara: every house, every village is surrounded with trash, mostly plastic bottles and rusted cans. Some of the cans still make nice dividends for our lucky shareholders. Sunset is around 7 p.m., so we hurried to find a secure, hidden place to spend the night. 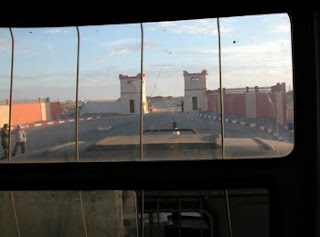 West Sahara is not safe, the closer to the Mauretanian border, the worse. So offroad between some dunes on the sea. 5. 12. 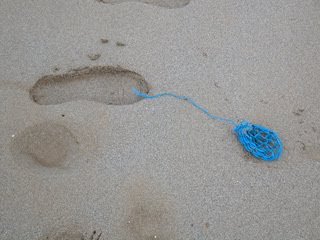 Starting early in the morning, after collecting a nice dividende for our lucky shareholders on the beach. Stop in Tarfaya, the next village with a bank to exchange money, buying fruit and rubber boots for the next garbage adventures. Taking a nice dividende for our lucky shareholders on the street. Rest of the day (police-)stop and go. Everybody wants a "fiche" with all our personal data, and we were filling in our pre-print "official" Austrian forms in the shaking truck while driving, to save time at the stops. The street gets narrow, almost no more traffic, the landscape does not change much. Medidative monotony, hot and dry. Found an internet cafe in a small village and spent hours to put a few pix online. Then into the desert in the darkness, for canned beans, lentils and sleep. 4. 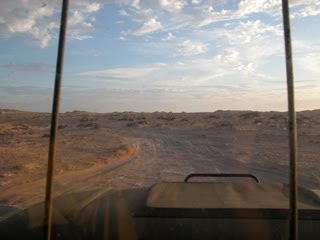 12. early in the morning heading down south through West Sahara for the Mauretanian border. West Sahara is a narrow strip of desert along the Atlantic Ocean, occupied by Morocco. The inhabitants are mostly nomads, fighting for their autonomy. Police controls before entering every village. Penalty of Eur 40,- for overseeing a stop-sign, and out of money again. The policemen did not realize, that we had no more insurance, so this was still good luck. It becomes warmer and warmer. First sand dunes, camels, dust. Sleeping in in Sidi Achfnir, a small fishermen´s village near the beach, in the backyard of the restaurant were we could get dinner for our last 100 Dirhams (Eur 10,-).